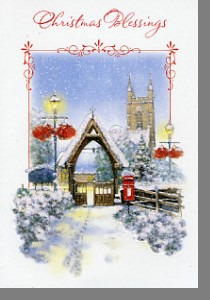 A beautiful traditional style religious Christmas card with a lovely verse inside sending Christmas blessings. The front design with its snowy Church scene has a liberal helping of glitter and is embossed. Inside has a colour print and Bible verse taken from the Gospel of Luke.